Dallas Fair Park - 23 Children's Aquarium. 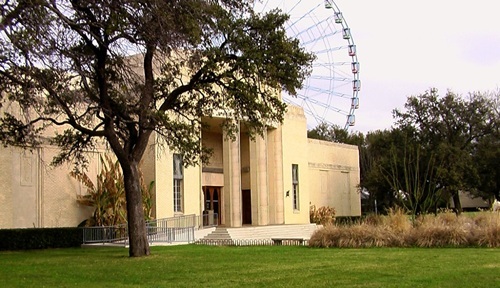 Originally called the Hall of Aquatic Life, the Children's Aquarium at Fair Park stands northeast of Leonhardt Lagoon. A local firm called Fooshee & Cheek, known for designing Highland Park Village, worked with H. B. Thompson and Flint & Broad to make the plans for the building. The exterior was modeled after the Seattle Art Museum while the interior reflected the John G. Shedd Aquarium. Construction soon followed on the structure, which would be made out of a combination of brick, limestone, and shellstone. Allie V. Tennant, who had worked on the Tejas Warrior in front of the Hall of State, then began carving bas-reliefs of sea life into the walls. Carrying a final price tag of 200,000 dollars, the aquarium was ready for business in 1936 in time for the exposition. During the first year of operation, the place had forty-four tanks made of metal, concrete, one-inch plate glass. Features such as arch ceilings, tank skylights, and protective handrails represented the latest in exhibition technology. The facility hosted a variety of fish, reptiles, and amphibians. However, the vast majority of the specimens were freshwater because of the costs associated with maintaining a saltwater environment. Regardless, the aquarium was a huge success. Most people had never visited one because there were currently only twelve in the entire United States, making the new attraction the first aquarium built in the state of Texas. When it came time to choose a director, officials chose an unlikely candidate. Pierre A. Fontaine was born in 1905 on a ranch in White Settlement, Texas. At the age of three, he witnessed the death of his mother. A year later, his Swedish father moved to Dallas and worked as a manager for the Karo Syrup Company, then married a woman named Florence Janelli. In 1924, he attended SMU, not knowing what career he wanted to pursue. A year later, his father took the family on a vacation tour of their homeland. Pierre loved it so much, his grandfather convinced him to attend the University of Lousanne, a school famous for producing some of the greatest chefs in the world. Pierre graduated in 1927 and acquired a contract to work at the Grand Palace Hotel in Tokyo, Japan. However, he soon received word that his father was ill. He moved back to Dallas and watched over father until he got well again. Pierre stayed in Dallas and worked as an assistant chef steward for the Hotel Adolphus. He didn't like arranging bouquets, so he left the hotel a year later. He then took over Janelli Advertising Services. At this time, he started collecting fish again, a hobby he had started as a kid. He also began building up a small aquatic library and studied sea life in earnest. On a blind date, Pierre met Josephine Clark and married her in 1930. Together, they had two kids. Despite the Great Depression, he did well in the advertising business. When the Park Board started looking for someone to run the aquarium, the members were told to check out Fontaine, who supposedly had the best home aquarium in the Southwest. When they arrived, they saw that he had a collection of 3,500 fish. Impressed with his ability to take care of them, the board members hired him. Fontaine sold his advertising agency and went into deep study mode for the position. As director, he became highly successful and gained the respect of everyone. 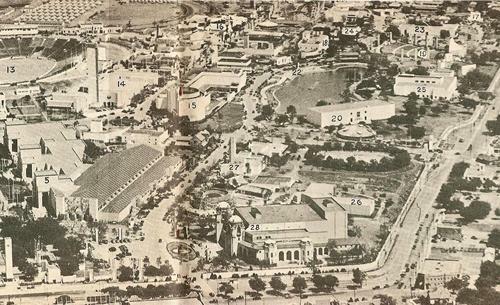 The Hall of Aquatic Life became the Dallas Aquarium after the Pan-American Exposition came to a close. Sixty-eight more feet was added to the building's north hallway in 1963, making the attraction the third largest aquarium in the nation. Tragedy arrived in 1968 when Fontaine, who had reduced his role at the aquarium so he could serve as the head of the Dallas Zoo, died from a sudden heart attack. As years passed by, the aquarium suffered from neglect. Their were ceiling leaks, exposed rebar, rusting pipes and conduits, deteriorating tanks, and broken skylights. To make matters worse, the place lost its official accreditation. Something had to be done. Bond election money from 2003 and 2006 was used to completely renovate the building. At the cost of eight million dollars, it opened in 2010 as the Children's Aquarium at Fair Park. The current aquarium is divided into six areas called the Freshwater Zone, Intertidal Zone, Shore Zone, Near Shore Zone, Offshore Zone, and Stingray Bay. The Intertidal Zone has an area which allows guests to touch a variety of small marine animals like hermit crabs, sea urchins, and horseshoe crabs. Visitors are also allowed to pet stingrays and feed them at Stingray Bay, a place where people can view sharks and special feeding demonstrations. There are other feeding shows, depending on the day of the week. In addition to the regular exhibits, there are birthday parties, summer camps, and overnight parties.